Imagine a world in which every single human being can freely share in the sum of all knowledge. That's our commitment. This is the vision for Wikipedia and the other Wikimedia projects, which volunteers from around the world have been building since 2001. Bringing together the sum of all human knowledge requires the knowledge of many humans — including yours! Wikipedia? Type WP:STATS into the search bar as pictured here. The text WP:STATS is what’s known on Wikipedia as a shortcut. You can type shortcuts like this into the search bar to pull up specific pages. In this brochure, we designate shortcuts as | shortcut . Wikipedia—the free encyclopedia that anyone can edit—is one of the largest collaborative projects in history. With millions of articles and in hundreds of languages, Wikipedia is read by hundreds of millions of people on a regular basis. A lot of content already exists on Wikipedia, but many important topics have poor coverage and some have no article at all. Wikipedia relies on contributors like you to keep information current, expand short "stub" articles, and create new articles on topics not already covered in your language Wikipedia. Contributions you make to Wikipedia can enlighten hundreds, thousands, or even millions of people worldwide. What you contribute to Wikipedia is free content and becomes part of the commons. It may be edited and reused by others under a free license. When you make an edit to Wikipedia, you're joining a community of hundreds of thousands of people—Wikipedians—who have freely contributed their knowledge to Wikipedia. What Wikipedians are doing has the potential to change the world. But there's still a very long way to go before we collect the sum of all knowledge. That's why we need your help. Today, I'm carrying on my grandfather's life work and his passion for recording local history and heritage. The difference is I have a tool my grandfather did not — Wikipedia. We want a world that is more open, more educated, and more free. We want a world where knowledge is available to anyone that seeks it. As you get started, it's helpful to familiarize yourself with the interface and how to navigate Wikipedia pages. 1: Each article has a corresponding Talk page where contributors can leave comments and suggestions, discuss changes, and ask for help from one another. 2: Here you can find some of the best work on Wikipedia: articles, photographs, and other content that meet the community's highest standards. 3: The Help pages, just like the articles, are written by Wikipedia contributors. 4: The community portal lets you explore what's going on across Wikipedia, from news to collaborations to policy discussions. 5: This section has useful tools for getting more information about a page and its history. 6: These are the other language versions of Wikipedia—out of more than 280 — that have an article on the same topic. 7: These settings allow you to change the language used for menus and select your keyboard layout. 8: Many readers never notice the Edit button, but it's the most important part of any Wikipedia article. Click the Edit button at the top to edit the whole article, or click one of the inline links to edit a particular section. 9: The history of a Wikipedia article includes every contribution since it was created. You can see who changed what when, and compare any two versions side-by-side. 10: If you haven't done so yet, create your account. With an account, you can keep track of your contributions, create a personal User page, and receive Notifications when other contributors reply to you or build on what you've done. 11: Find articles by name, or find pages that include your search terms. You can also enter shortcuts to bring up specific pages that we reference throughout this brochure. A useful one is | shortcut WP:HELP . Volunteers contribute in more ways than one. Here are examples of what it takes to make Wikipedia happen. When I have kids, I want them to know Nepal's culture and our rich history, and to learn it in our own language—and Wikipedia is making that possible. When I searched on Wikipedia, there was nothing. So I decided to write the article myself. To date, more than 18,000 people have read my article. Some have even added their own information and sources. I learned to speak English by fighting vandalism on Wikipedia. Everything on Wikipedia must be written from a neutral point of view. Articles must not take sides, but instead should describe — accurately and without bias—all the significant viewpoints on the topic published in reliable sources. Argumentation or advocacy does not belong in Wikipedia articles. Simply put, Wikipedia is not a place to publish original ideas. Rather, you should summarize what others have published in reliable sources about the topic. Articles may not contain any new analysis, and they should not synthesize published materials to reach broader conclusions beyond what the individual sources say. Information in Wikipedia needs to be verifiable, based on reliable published sources. You should include citations for the information you add to the encyclopedia, so that others can check it for themselves. The most reliable sources for Wikipedia are third-party sources with a reputation for fact-checking, such as books published by academic presses, peer-reviewed academic journals, and international newspapers. You should be using sources that represent significant viewpoints, rather than one-off studies or fringe work. Try to find the best and most reliable sources available on the topic. If you have a conflict of interest about a particular topic—such as an employer or an organization you are a part of—you should avoid editing articles about it. Writing in an encyclopedic style and a formal tone is important when adding new content to Wikipedia. Instead of essay-like, argumentative, or opinionated writing, Wikipedia articles should have a straightforward, just-the-facts style. Here are examples of the do's and don'ts of encyclopedic writing. Encyclopædia Britannica, although a celebrated and historically significant encyclopedia, has little relevance in modern society. Instead, most experts agree that the future of the encyclopedia genre belongs to Wikipedia and other wiki encyclopedias — created by regular folks like you and me. Ironically, while it was a great influence on Jimmy Wales and the intrepid new generation of amateur encyclopedists who created—and continue to create — Wikipedia, Britannica in recent years has come to symbolize everything wrong about the old ways of creating and distributing knowledge: top-down control, unaccountable gatekeepers who decide what does and does not merit coverage, copyright restrictions and high prices that limit access to the wealthy, and—in its current online form—intrusive advertising that undercuts the reliability and usability of its content. Don't create new essay-like articles or sections. Don't structure your writing as an argument. Don't use "weasel words" (like "most experts agree" or "some people say"). Don't use colloquial language or slang. Don't use "peacock terms" (like "great", "extraordinary", or "intrepid"). Don't inject personal opinion into the writing. Don't use overly complex language and sentence structure. With VisualEditor, you can see what your changes will look like as you edit, so you can focus on the content. Just click on the parts you want to change and start editing. In edit mode, the toolbar lets you add formatting, references, images, and special page elements called templates (such as the infoboxes at the beginning of many articles). When you are finished editing, press the "Save page" button. The first sentence provides a definition of the topic, and the lead section goes on to summarize the key points covered in the article. This is the only section without a heading. Freely licensed images and other media files can be added to Wikipedia articles from Wikimedia Commons. Inline citations in the body of the article are used to show where the information in each part of the text came from. The citation details appear as footnotes at the end. Reusable pieces called templates are used to format information in standard ways, and to insert things like the banners that alert readers to problems with an article. Headings—and sometimes sub-headings—break the article up into sections, and are used to generate the table of contents. Each section usually covers some significant aspect of the topic, so that readers can jump right to the information they are looking for. After the main body of an article come sections with additional information, such as related Wikipedia articles ("See also"), footnotes with details on the sources used ("References"), and a list of other websites readers could turn to for more information ("External links"). An image should appear at this position in the text. If you are able to provide it, see Wikisource:Image guidelines and Help:Adding images for guidance. Wiki markup is the original form of editing Wikipedia articles (and on some browsers, it will be the only form available). It gives you precise control over the content and appearance of the page, once you understand how it works. Some of the underlying wiki markup for an article is pictured below. See how many of the corresponding elements you can find in the VisualEditor illustration. Double square brackets around the title of a photo from Wikimedia Commons will insert the image. Pipes separate optional parameters to control how the image is displayed. The most common way is with two parameters: the word "thumb" to use the standard thumbnail format, and a descriptive caption that appears beneath the image. Three single quotation marks before and after a string of text makes that text bold. The article's subject is usually bolded in the first sentence. Opening and closing ref tags are used to cite a source. An automatically-numbered superscript appears at the location of the ref tags, and the content appears as a footnote in the references section. Double square brackets around a term create a link to the article of that name. Adding a pipe and another string of text before the closing square brackets changes the link text. Two single quotation marks begin and end a segment of italic text. A pair of double equals signs mark a line as a heading. Triple equals signs make a sub-heading. Double braces are used for templates, which are reusable page elements that serve many purposes. The first item after the opening braces is the template's name. Pipes separate the parameters, which are additional inputs that can change the way the template works or what it displays. The references tag, or an equivalent template, sets the location where the footnotes show up — typically in a "Notes" or "References" section. A single square bracket, followed by a URL, a space, label text, and a closing square bracket makes a normal hyperlink. Typically, they are only used in footnotes or an "External links" section. At the end of an article, double square brackets around a string that starts with Category: adds an article to the specified category. Categories organize Wikipedia articles into related sets. For more wiki markup help, see the cheatsheet on page 19 or visit the reference page | shortcut H:MARKUP . 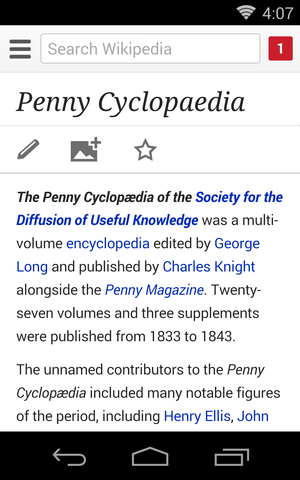 These images show how one contributor added new information to the article on Penny Cyclopaedia. …and the article after changes were saved. This image shows what the contributor added and the markup they used. Follow these steps and you too can add content to a Wikipedia article. Step 1: Pick a topic you want to write more about. Step 2: Find a reliable source that covers the topic better than the current Wikipedia article. Step 6: In the 'edit summary' field, add a brief description of what you've done in your edit. D (With VisualEditor, you'll be prompted for an edit summary after you click Save page.) The edit summary helps other editors understand what you are doing. Don't worry. If you make a mistake, you can always make more changes or restore a previous version of the article. Wikipedia has other types of pages beyond articles. As you start editing, you might also want to create your User page to let others get to know you a little bit. At the top right (if you are logged in) you will see your username, which you can click to reach your User page. Links to pages that do not exist — such as your User page if you have not created it yet—are colored red, instead of the typical blue. If you click the Create button on one of these pages, you can start from a blank page. A User page is a place to write a little bit about yourself, to give other contributors an idea of who you are and what you're interested in. You can share as much or as little as you like. When you Save the page, your red link will turn blue! You also have a User Talk page, where other contributors can leave messages for you. If you want to contact another contributor, you can navigate to their Talk page and leave a message at the bottom. You should sign your messages on Talk pages; clicking the Signature button in the edit toolbar will insert four tildes ( ~~~~ ), the special wiki markup for inserting your username along with the date and time of your message. Every article has its own Talk page, too. These Talk pages can be used to make suggestions, post new sources, point out problems, and discuss changes that contributors disagree about. Look, a new Notification! These let you know when someone mentions your username, thanks you for an edit, or leaves a message on your User Talk page. One important guideline for community discussions on Wikipedia is to be respectful and civil. Even if you get into disagreements, you should assume good faith on the part of other contributors. They almost always have the same goal you do—to make Wikipedia better. Keep the discussions focused on content, rather than making them about individual contributors. In addition to the traditional desktop interface, Wikipedia has a streamlined mobile version that you can use to both read and edit. Just visit Wikipedia on your smartphone or tablet, then log in. I love knowing that I'm contributing to something bigger than myself. On one side, you have a bunch of rich, powerful companies. They want to turn the web into a medium for consumption: interactive television meets shopping mall. On the other side, you have a bunch of people who think the Internet can change the world. Everybody reads Wikipedia. If they want to learn something, they turn to Wikipedia first. I know I've helped a little—maybe even a lot. And that's the greatest feeling I know. Each language version of Wikipedia is different (although there is a lot in common across languages as well). These are some of the things specific to English Wikipedia that you may find useful. Starting a new article on English Wikipedia—and making sure it doesn't get deleted—can be tricky. For a detailed guide on creating your first article, see | shortcut WP:FIRST . The Signpost | shortcut WP:SIGNPOST is a weekly community newspaper, covering Wikipedia-related news and research, important discussions, new Featured content, and more. You can even subscribe to have it delivered to your Talk page each week. In general, only freely licensed or public domain images can be used to illustrate Wikipedia articles, and these should be uploaded to Wikimedia Commons (commons.wikimedia.org). However, limited exceptions are allowed on English Wikipedia under the non-free content rules | shortcut WP:NONFREE for things like album covers. Non-free images uploaded to Wikipedia without a clear justification under the rules will be deleted. WikiProjects are groups of contributors who have a common interest when it comes to editing Wikipedia. Browsing the existing WikiProjects | shortcut WP:WIKIPROJECT and joining ones that interest you can be a good way to find things you want to work on and connect with other Wikipedians. WikiProjects on English Wikipedia have a system for rating the quality and importance of articles, known as the Wikipedia 1.0 assessments | shortcut WP:ASSESS . For quality, these ratings go from Stub (just the beginnings of an article) to Start to C-class to B-class, and then the formally reviewed ratings of Good article, A-class, and Featured article. You can see the ratings for an article at the top of its Talk page, and most WikiProjects maintain a table showing how many articles related to that WikiProject have each rating. Browsing WikiProjects for Stub and Start articles is a good way to find new topics to work on. Additional information about article quality is available by consulting the "Evaluating Wikipedia" brochure (see below). How articles evolve, elements of good quality articles, and signs of poor quality articles are all covered in this guide. I took this great photo I can use to illustrate Wikipedia! That means I'll need to upload it to Wikimedia Commons. A companion guide covering Wikimedia Commons, the media repository for images used on Wikipedia. The brochure covers what Wikimedia Commons is, how to upload files, how to use files, and the basics of free licenses. This brochure offers best practices for educators looking to assign students to contribute to Wikipedia as part of their course curriculum. These examples cover the formatting needed most often when editing Wikipedia articles with wiki markup. For more help, see | shortcut H:MARKUP . Insert a citation Page text. <ref>[http://example.org Example.org], more text.</ref> Page text. A brief explanation of an edit to a Wikipedia page, which helps other contributors follow the development an article and understand the intention of the edit. A public copyright license that ensures the freedom to use and study a work, to make and redistribute copies of it, to make changes and improvements, and to distribute derivative works, by any person for any purpose. Wikipedia—and each individual contribution to it—uses the Creative Commons Attribution-ShareAlike license, which is a free license. See | shortcut WP:CC-BY-SA to learn more. The record of a Wikipedia page, accessible through the View history tab, that shows every edit made. Any two versions can be compared to see the specific differences (known as a diff), and previous versions can be restored. The special code used to format a Wikipedia page. See the cheatsheet (page 19) for the basics, or go to | shortcut H:MARKUP for more detail. A message for you that shows up at the top of a Wikipedia page. If you want to let someone know you replied to them, you can create a Mention Notification by including a link to their User page in a signed Talk page message. A bit of text, separated from other bits with a pipe character (|), that is used to control how images, templates, and other wiki markup appear on a page. A short, undeveloped article with plenty of room for expansion. Adding content to stubs is a good way for new contributors to get started. The discussion space for an article or other Wikipedia page, where you can talk about the contents of the page with other contributors. A way of automatically including the contents of one page within another. For instructions on using them, see | shortcut H:T .
The personal page of an individual contributor, which begins with "User:" followed by their username. Wikipedians can use their User pages to share information about themselves and their interests, list the articles they have worked on or want to work on, and much more. The media repository for Wikipedia and many other wikis, where you can contribute freely licensed photos, diagrams, videos, and other media files for illustrating Wikipedia. Someone who helps build Wikipedia. Common synonyms include contributor, user, editor, and community member. All images from Wikimedia Commons are under a CC BY-SA license or public domain unless otherwise stated. The content contained within is available under the Creative Commons Attribution-ShareAlike License v.3.0 (http://en.wikipedia.org/wiki/Wikipedia:CC-BY-SA) or any later version. This page was last edited on 11 October 2018, at 21:21.